In a large pot melt the butter at medium heat. Add the chopped onion and garlic, along with 1/2tsp of salt, cook until slightly translucent, about 5 minutes. Whisk in the flour and cook until a light golden color, stirring frequently, approximately 3 minutes. Add the half and half, whisk until smooth. Add the chicken stock, bay leaves, nutmeg, salt and pepper, bring to a boil then reduce heat to medium-low and simmer uncovered for 20 minutes, stirring periodically. Discard the bay leaves, add the broccoli florets and diced carrot, continue to cook uncovered on medium-low for 35 minutes, stirring periodically. Use an immersion blender to puree the soup, if you do not have one then puree the soup in batches in a food processor or blender. You want it smooth, but you still want some small chunks of broccoli and carrot. Add the sour cream, 6oz of shredded cheddar and the grated parmesan, cook uncovered on medium-low for an additional 5 minutes, stirring frequently. That’s it, you’re done! Serve in a bread bowl or regular bowl, and garnish it with the remaining shredded sharp cheddar and the chopped chive, then dig in. Comfort food doesn’t get much better than this! Oh yeah, and if you have any leftover soup the next day it makes a great sauce for pasta, especially with some sausage. 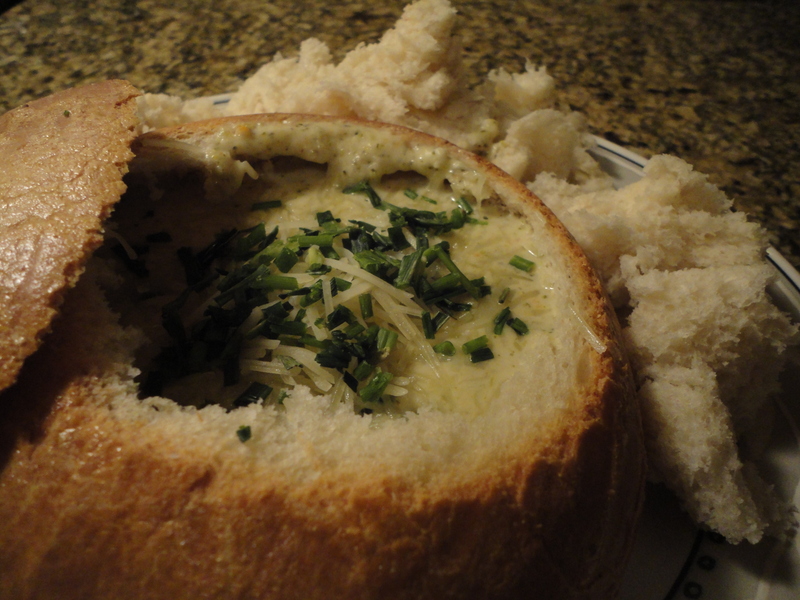 Tags: bread bowl, broccoli soup, cheddar cheese, comfort food, fall, perfect pairings, perfect pairings at home, soup, soup in bread bowl, winter. Bookmark the permalink. Previous post ← Chocolate Peanut Butter Blondies! A 50/50 mixture of heavy cream and whole milk, popular in North America. Today is definitely the perfect day for it! One hell of a storm we’re having… meh. The soup should make it all better though, lol. Let me know how you like it! best. soup. ever. without a doubt. and i’ve made a lot of pots of soup!!! Made this for dinner tonight. I lightened it up with fat free half and half, light sour cream and 2% cheddar. I know it’s probably sac religious but know that’s it’s still DELICIOUS! !